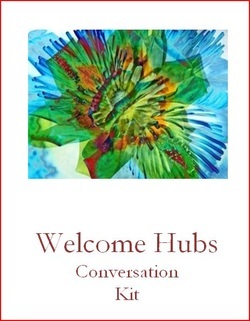 Welcome Hubs arose out of a desire to respond to new arrivals in our local communities. The new arrivals being people seeking asylum. Asylum seekers have unique language needs. They need language that will help them to connect and survive in their local communities. Connect with local services, local people in order to find accommodation and work (paid or volunteer - visa permitting). In light of their needs, welcome hubs are designed to provide the relationships and words new arrivals need for daily living. Words for communication, not grammar lessons. Words that are used in relating to locals, not text books or worksheets. Words that promote understanding, hope and a sense of belonging. In this kit you will find 8 welcome conversations with resources. Each conversation covers a topic that interests new arrivals. They are designed for each local community to add/adapt and provide pictures suitable for their group of new arrivals.